Looks like Kim Kardashian's daughter North West may be following in the footsteps of her aunt, model Kendall Jenner! The 5-year-old child made her runway debut on Saturday, walking in the LOL Surprise! fashion show in Pacific Palisades near Los Angeles. The event celebrated the launch of the toy brand's new Bigger Surprise product. North dressed up as the LOL Surprise! doll Thrilla. Simone Harouche styled the child, whose character's look is inspired by Michael Jackson's Thriller costume. Wearing a red leather jacket and matching mini skirt, a zip-up black crop top, white socks, black shoes, a black Cult Gaia purse and red lipstick, North made her way down the catwalk as proud mama Kim looked on and filmed her on her phone. North makes her runway debut in the LOL Surprise! toy brand fashion show in September 2018. Kim Kardashian takes out her phone to record her daughter. A proud Kim Kardashian poses with her daughter. Kim Kardashian and her daughter strike poses. Kim Kardashian hangs out with fellow E! personality Busy Philipps. 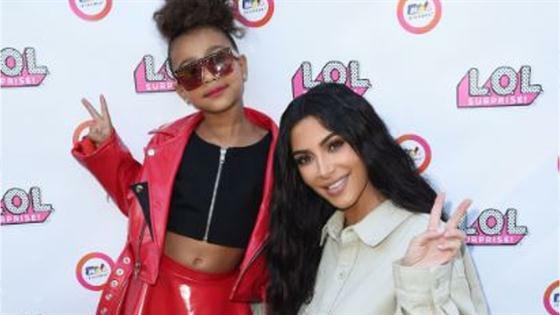 "North is completely obsessed with LOL Surprise already, so when we found out there was going to be an LOL Surprise Bigger Surprise Fashion show, she absolutely had to be involved," Kim said in a statement. "She loves to dress up like her favorite characters, so it was so exciting for her to actually become a real-life LOL doll." Other celebrity kids also walked the runway; Sara Foster's daughter Valentina dressed up as the LOL Surprise! doll POP Heart, while E! talk show host Busy Philipps' daughter Birdie channeled Famine.